Compared to other high-income countries, Canada’s health system performs poorly. It delivers neither the highest quality of care to citizens, nor does it deliver good value for money. New approaches are needed. 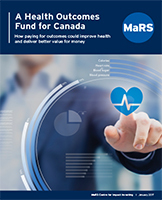 This paper sets out the case for establishing a health outcomes fund dedicated to delivering better care and improved health for Canadians. The fund would create a pool of capital dedicated to paying service providers – for instance, doctors, hospitals or charities – for achieving pre-agreed health outcomes in target populations. The potential benefits of this include: shifting funding from an approach based on volume of activity performed to one focused on the health improvements created; curbing demand for health services by investing in prevention and supporting patient self-management, and shifting care from clinical settings into the community. It also responds to broader aims to collect and leverage data to improve service delivery, and to root policy decisions in sound evidence.